Profession: Screenwriter, writer, producer, executive producer. Born in New York City, USA in 1909, Richard Maibaum attended New York University and later the University of Iowa before working his way through the ranks of on and off-stage performance. Richard Maibaum quickly found himself working on the scripting of several successful Broadway productions. The fast-working screenwriter soon earned film work; his debut script was with Maurice Rapf. The ultimately forgettable "We Went to College" hit cinemas in 1936, however, after serving in the War, Maibaum signed a contract with Paramount Pictures, and notably adapted "The Great Gatsby" (1949) for the studio. Another constant in Maibaum's career was work with Alan Ladd. Shortly after meeting, Maibaum began to act as a script supervisor for Ladd and it was through the screenwriter's connection with this star of the day that Maibaum came to the attention of Albert R. "Cubby" Broccoli. Maibaum ran into Terence Young, who would become famed for crafting the on-screen image of James Bond in "Dr. No" and a further two Bond outings, as early as the '50s. The war drama "The Red Beret" (1953) was Young's breakthrough production - scripted by Maibaum. The next year, "Beret" was followed up with "Hell Below Zero" (1954). Both films were produced by Broccoli and his then-business partner Irving Allen. 1956 saw the production of the memorable "Ransom!" - which would be famously remade by Ron Howard in the 1990s. After "Ransom!" Maibaum's fast-paced career slowed, but with James Bond only a few years away, little did he know that 007 would keep him busy for the rest of his working life. Maibaum's scripts would bring wit and charm to the screen incarnation of 007 and his work would be a staple of the James Bond films. For over 25 years Maibaum would contribute to an impressive 13 James Bond films. Of finding new plots for 007, Maibaum has said, "It's murder. I've said this many times, but the real trick of it is to find the villain's caper. Once you've got that, you're off to the races and the rest is fun." On his last 007 adventure, "Licence To Kill" (1989), a WGA strike limited his participation in scripting this film. 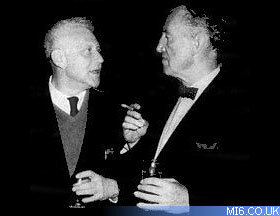 Right: Richard Maibaum and author Ian Fleming. Between Bond's, Maibaum took on projects such as "Jarrett" (1973), "S+H+E: Security Hazards Expert" (1980) and Broccoli and Saltzman's own film adaptation of "Chitty Chitty Bang Bang" (1968). After "Licence To Kill" (1989), 007 went on ice and Maibaum faded from the picture. Aged 80 when Timothy Dalton's second outing was released, Maibaum took this opportunity to retire from a full career in the film industry. He made many lifelong friends throughout his time on the Bond pictures - Peter Hunt to name just one - and all the cast and crew cherish memories of the screenwriter. 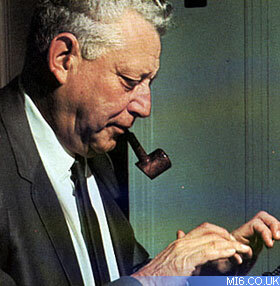 The famed screenwriter passed away on 4th January 1991 in Santa Monica, CA, after an illness.